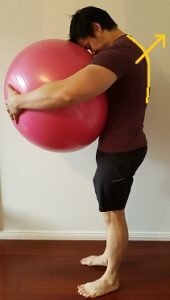 Looking for some great Scoliosis exercises? This blog post will go through the exact exercises to help you to straighten your spine! Note: With the presence of 2 (… or more) curves, there is a primary and a compensatory curve(s). The compensatory curve is the attempt of the body to maintain an upright posture as a response to the primary curve. 1. Structural Scoliosis is determined by your genetics and/or as a result of fused joints. If you have had your Scoliosis for a long period of time and the joints have fused together, then there is a smaller likelihood of significantly impacting the shape of your spine by performing the Scoliosis exercises. 2. Functional Scoliosis is determined by how your body habitually holds itself up as it attempts to maintain an up right posture against gravity. Take note of the severity of your Scoliosis. Bend forwards at the waist until your torso is horizontal. Nil change to alignment ➡ Structural Scoliosis. Partial or full correction of alignment ➡ Functional Scoliosis. The habitual positions that you adopt on a daily basis can often lead to Scoliosis. The spine becomes so accustomed to using certain muscles in a certain position, that over time – you are now “hard wired” to hold this abnormal posture. It limits the accessibility to the full range of movement of the spine in which posture and movement requires. The body functions more efficiently and effortless with better alignment. How can you move properly if you do not start from a good position? Getting a Xray scan is going to be the easiest and most accurate method. If your doctor is happy to refer you and you’re not opposed to the radiation involved with the scan, then go for it! I recommend getting a EOS scan which I believe has 7-9 times LESS radiation than the standard Xray. Draw a vertical line that is the mid point between the 2 hip joints. This shows how much the alignment of your spine deviates from the ideal mid line. Draw a line between the waist heights. 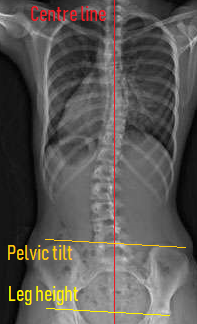 This shows if your pelvis is level or tilted. Draw a line between the top of the hip bones. This shows if your legs are standing at the same vertical height. This shows you the exact location of your Scoliosis. This determines the severity of the Scoliosis. Draw a line that matches the angle of these 2 vertebra. The point where these 2 lines intersect creates the Cobb’s angle. ** The following Scoliosis exercises are best suited for those who have a curve of <20 degrees. The following Scoliosis exercises serve as a starting point when addressing the curvature of your spine. For best results for your specific presentation – perform these exercises in conjunction with seeing a health professional. There are NO short cuts in improving your Scoliosis. It takes time. As the position of the pelvis has a significant influence on the orientation of the entire spine, it is vital that this structure is in a neutral position when addressing your Scoliosis. This is the asymmetric positioning of the pelvis which creates uneven waist heights. ➡ To address this issue: Check out this post: How to fix a Lateral pelvic tilt. Asymmetries between the length of your legs can lead to a lateral pelvic tilt. Measure the distance from the ASIS to the Medial Malleolus. Results: If these lengths are significantly different between the legs, then you may have a leg length discrepancy. Alternatively – you can get a CT scan to measure it. ➡ To address this issue: If you have a true leg length discrepancy, consider getting inserts in your shoe to address the height difference. This is where the pelvis is twisted and facing more towards one side. ➡ To address this issue: Check out this post: How to fix a Rotated pelvis. … Now that the pelvis is level, let’s get on with the Scoliosis exercises! 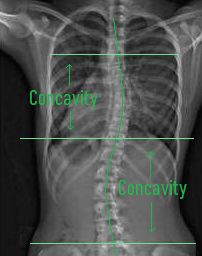 It is important to know WHERE your concave curve is located. For simplicity sake – release the muscles which fall within the shaded area of the concavity. These muscles will tend to be tight and/or over active. For the correct placement of the massage ball, use Google Images to locate the muscle you are trying to target. Place the target muscle on the side of your concavity on top of a ball. Apply your body weight on top of the ball. Make sure to cover the whole concavity. Place a finger in the gap between the ribs on the side of the concavity. Apply a firm pressure as you trace around the ribs. Continue for 1 minute per rib level. Stretching addresses the tight muscles that are holding the spine into a particular pattern of Scoliosis. It is very important to know the exact location of the apex of the curvature of your spine. This will dictate how and where you will perform these stretches. Aim to FEEL the stretch in the region of the concavity at the level of the apex. Hold each stretch for at least 10 minutes (… go longer if you can). Lie down with the side of concavity towards the ground. Whilst keeping your waist pinned down to the ground, push your torso up right. Aim to feel a stretch on the side of your rib cage. Take a deep breath into the area where you feel the stretch. 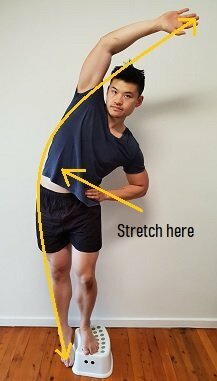 Note: The angle of your torso whilst performing this stretch should be dictated by the area of the thoracic region you are targeting. 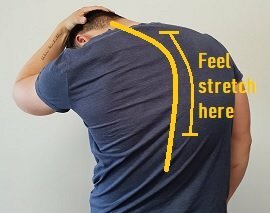 Curve your upper back region forwards. Aim to curve your spine at the level of the apex. Side bend the spine away from the side of concavity. Try to isolate this movement to the apex region. Pull your head towards the armpit that is on the opposite side of the concavity. Aim to feel a stretch on the side of your spine. From a standing position, cross the leg on the same side of your concavity behind the other leg. Place your hand on the outer hip opposite to the side of the concavity. 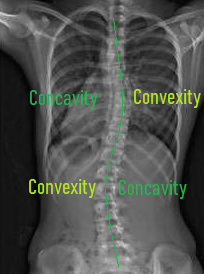 Push your hip towards the side of concavity. Make sure that you do not rotate your pelvis. Reach up/over with the arm on the side of the concavity. Aim to feel a stretch on the sides of your mid torso. To get the most out of the stretch, try placing your body at slightly different angles. To progress: Hold onto a stationary object with the over reaching arm and allow your body to hang off this arm. 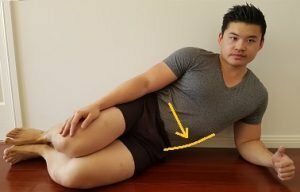 For more stretches like this, check out this post: How to stretch the Quadratus lumborum. Which one to use? Pick the equipment with the appropriate width that you can comfortably feel the stretch. Lie on top of the equipment of your choice with the side of convexity on the lower side. 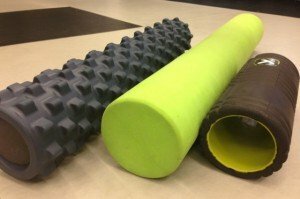 The foam roller should be on the same level of the apex. Reach over head with the upper arm. Aim to feel a stretch on the upper side (concavity). Take deep breaths in this position. The aim of breathing is to increase the stretch. To perform the following Scoliosis exercises, you will need to learn how to “bow the spine”. “Bowing” is the movement of a specific part of the spine (… as opposed to moving the whole spine) which allows for certain areas to be stretched or strengthened. The aim is to move the spine so that the apex of your curve is shifted towards the opposite direction. Sit on the floor in the position as shown above. Place the hand on the same side of the thoracic concavity onto the floor. Keep your arm completely locked straight. Sink your weight into your hand. 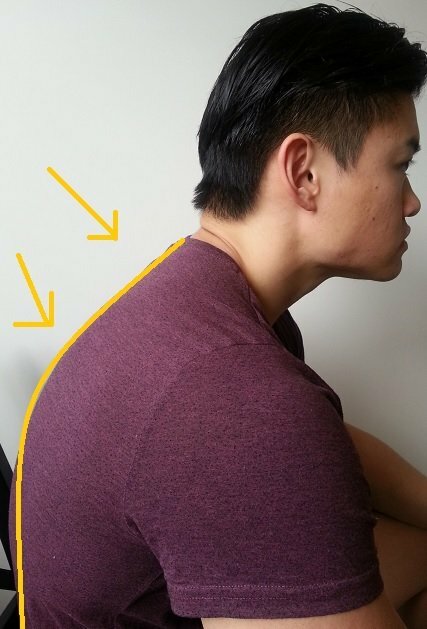 Keep the shoulder relaxed. It should naturally shrug up as you do this. Bow the apex of your curve towards the side of concavity. … Do you have at tight thoracic spine? Check out this post: 17 exercises to improve your thoracic spine. Stand on the edge of a step with the leg on the opposite side of the lumbar concavity. Keep this leg slightly bent and stationary throughout the exercise. Reach your hand up/over your head. After investing some time with the above Scoliosis exercises, you should notice that your spine is not as restricted as it was before. A malleable spine will enable you to perform the following corrective exercises more effectively. Perform these exercises whilst using a mirror as to provide visual feedback of your posture. Move as far as the body will allow you to without causing significant distortions to the rest of your alignment. Remember – our immediate goal here is to reduce the degree of curvature (… even if it is a small amount) and not to eliminate it completely. You are aiming for your best possible correction for your current level of ability. If you are having difficulty with the corrections, focus more time and effort on the Releases/Stretches/Strengthening exercises. Remain seated. Keep equal weight distribution between your buttocks. Remain elongated throughout the spine. Imagine your head is being lengthened towards the sky. Locate the apex of the convex curve. Bow the apex back into place as far as you can achieve without causing major distortions to the rest of your spinal alignment. Perform a gentle circle motion of your head and shoulder. Lift your buttock off the chair one side at a time. Take slow and deep breaths in this corrected position for 5 minutes. Use a mirror to help you guide your correction. Pay attention to the spinal curve, shoulder height, level of the head etc. SEE the correction. But more importantly – FEEL the correction. Target your correction to a single area first. Whilst maintaining this correction, proceed to address the other curve. Reset your head, shoulder and pelvis position. As you become more confident with the exercise, you can perform the corrections for the different areas at the same time. Aim: To maintain your best possible correction whilst performing the following Scoliosis exercises. 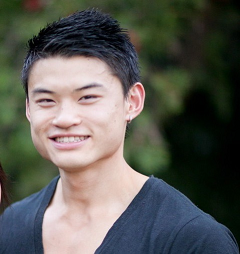 Initially – it is very likely that you will need you rely on visual feedback (ie. using a mirror/video) to help you maintain the proper correction. As your postural awareness improves with practice, aim to perform your correction by “feel”. Whilst sitting or standing, lift your arm above your head. Alternate sides. 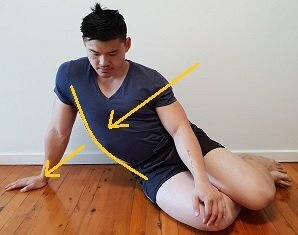 Whilst standing, lift your knee up to hip level. Alternate sides. From a sitting position, stand up right. Repeat. Whilst in the standing position, gently engage your core muscles. Bend forwards at the HIPS. Keep knees slightly bent. As you bend forwards, sit your hips backwards as you lean you forwards. Make sure that you maintain the torso alignment throughout movement. Hinge as far as you can until you can feel your hamstring start to stretch. Whilst sitting, rotate your torso as far as you can to one side. Make sure that your pelvis does not move. Try to get your fingers tips to touch. Starting from the neck: Proceed to round your spine down one vertebra at a time. The goal here is to emphasize the rounding over the areas where your Scoliosis is located. From here, reverse your movements back to the beginning. All this means is that you should perform your correction whilst doing any activity that is important to you! There is absolutely no point in performing all of these exercises if you continue to place your body in the position which has lead to your Scoliosis in the first place! Solution: Support your body with pillows as to maintain a straight spine. Solution: Ensure that you have equal weight distribution between your buttocks. Do not slouch to one side. Solution: Use a bag that straps over both shoulders. Solution: Ensure that you have equal weight distribution between your feet. Do not hitch your hips! Addressing other areas of postural dysfunctions may help the Scoliosis exercises (as mentioned above) be even more effective. ➡ Check out this post: Exercises for Hunched back posture. 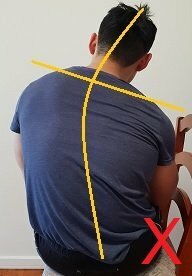 ➡ Check out this post: How to fix Flat back posture. ➡ Check out this post: How to fix Lumbar hyperlordosis. 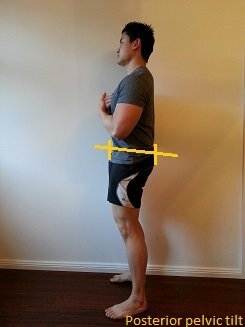 ➡ Check out this post: How to fix Anterior pelvic tilt. ➡ Check out this post: How to fix Posterior pelvic tilt. 1. How long will it take to fix? The short answer – it depends! 2. 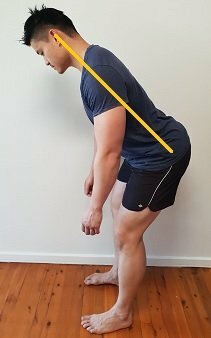 Will these Scoliosis exercises give me a PERFECT straight spine? However- the exercises will certainly help you attain and maintain a better spinal alignment as compared to what you have now. 3. 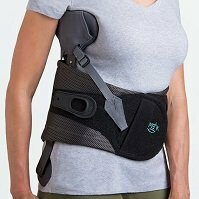 What about a Scoliosis brace? Wearing an external brace may help prevent or slow down the progression of Scoliosis. 4. Does everyone have it? It is important to note that almost EVERYONE has some degree of Scoliosis (Ranging from minor to major). Its presence is not always problematic in the short term. Scoliosis involves the abnormal sideways curves of the spine and presents differently from person to person. The Scoliosis exercises are designed to be most effective for curves that are <20 degrees. The Releases, Stretches and Strengthening sections are designed to give the opportunity for change to occur in the alignment of the spine. The Corrections are designed to engage the muscles responsible for bringing the spine into a better alignment. The Progressions will help challenge your ability to maintain the correction. For best results – use these Scoliosis exercises in conjunction with seeing a Physical therapist. So… What’s your Cobb’s angle? I’m curious! 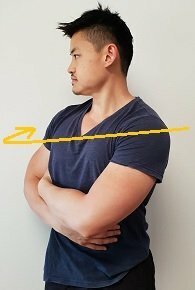 A blog to “uneven shoulders” or did I miss it? It’s all ready to be posted. I just need sometime to take the photos for the exercises. Make sure to follow me on facebook so that you’ll be first to be notified once I post it up. Created the conditions for this functional scoliosis and that I need to correct both, problem is I don’t really know how to program this, any suggestions? I’d like to start strength training too as I have very low muscle mass. You can start your strength training, but I would still prioritize these exercises for your scoliosis. It is possible to have a bit more pain/discomfort as muscles that aren’t used to being recruited, are suddenly being used. But at the same time, just need to be careful that your son is not compensating with the area that is now hurting through the exercises the trainer gave him. Glad that it has helped! Hi Mark, I have 20-degree thoracolumbar scoliosis with the concavity on the right side. I’ve always swum and I don’t feel pain unless I’m doing something with my back tilted forward (like moping the floor) or if I’m carrying weights in front of me (like a big box). I’ve also always stretched before swimming, but I don’t do any particular stretches for scoliosis or with a preference for one side. Should I add the (Leg drop/Arm reach) and (Side Tilt) to my stretch routine just to one side or is there a problem if I do both sides? You can do both sides as they are probably both have a degree of tightness. I would suggest to spend just a little bit more time on your tighter side. 23rd . Would like to get greater help with my issue. A complete mess in my opinion. Hoping to see if you can work with me and solving my problem that been having for 2+ years. Only 24. I am willing to travel. Please let me know thanks. I am having my presentation next week and this will definitely save me. she is 9 year old with spina bifida and scoliosis. she has very much weakness in lower limb. What are her goals for treatment? 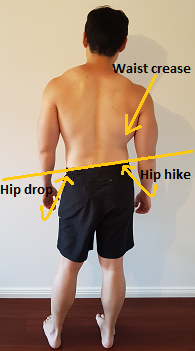 Hi Mark, I have all right-sided pain primarily in si and low back (QL) area but often extending all the way up to right shoulder. X Ray shows top of pelvis is higher on my left side by 14 mm, yet my right leg appears shorter. 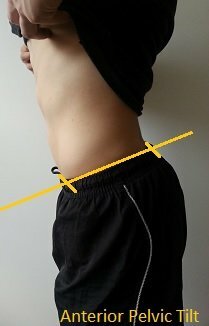 Hip height is 10 mm higher on left. Also I have a right shoulder drop. Does a left hip hike coupled with what appears as a shorter right leg lead you to suspect a structural component to this discrepancy? The practioner I’m currently seeing sold me orthotics with a lift for right leg and not only are they uncomfotable, they seem like a bandaid that’s only going to make my posture worse. Many thanks for your work and website ! This may explain your presentation. Hi Mark, how often should i exercise ? You can start off with every 2 to 3 days. Try to get to a stage where you can do it everyday. The exercises in the blog post will be great for a functional scoliosis. Thanks a lot for all the information you posted here. no physiotherapist educated me like this. i have multiple problem which are sciatica, rotated pelvic, lateral pelvic tilt and scoliosis. i want to get better soon but as you said it depends on my body. If you have Sciatica, I would probably do specific exercises for that first. Once your nerve is less irritable, you can start to address your lateral pelvic tilt if you feel that it is contributing to your issues. 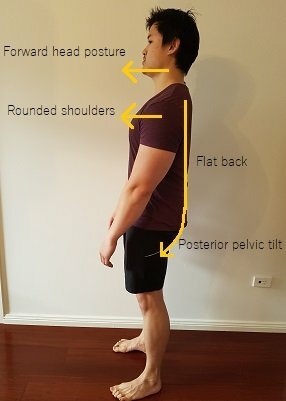 Hi mark, hats off for these detailed,informative posts about posture corrections. I have a query though I seem to have pelvic tilt, posterior pelvic tilt, uneven shoulders flat feet, the head tilt. This is where things can a little bit tricky. Having multiple areas to address can be overwhelming. The only wrong way to start is to not start at all. Pick one area and see how far you can take it. With your combination of postural deviations, you can start off with a lateral pelvic tilt as this may be the key area that is causing your scoliosis, uneven shoulders and head tilt. If your leg is Functionally short, then there should be no need for a heel lift. This is because once you balance out your muscles, there should be no difference in your leg length. If your legs are structurally unequal, then you might need a heel lift. 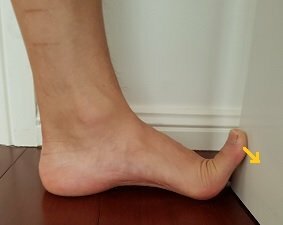 I usually suggest to see how far the exercises will take you before considering a heel lift. Anything more than 20mm is quite a lot and may require it.